With this September Equinox, sandwiched between two eclipses, the God and Goddess are stepping into New Roles. 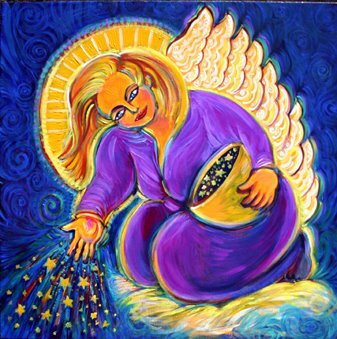 The first eclipse, a solar eclipse, is in the sign of Virgo which is the sacred domain of the Goddess. There has been much talk about the return of the Goddess recently. How she has been wounded, trampled upon and disempowered. How we need to dig deeply into the shadows to heal her wounds. But the wounds that are spoken of are human wounds that have been taken on in the name of the goddess. They are not wounds of the Goddess. For the Goddess is pure Love and Compassion. The Goddess does not suffer. She does not bear wounds. It is only the perception of humanity that attempts to fling them upon her. During this initial eclipse the Moon Goddess kisses the face of the Sun God in a blessing of healing for all of humanity. For those who feel old wounds arising, the Goddess asks that you turn them over to Her for healing rather than taking it upon yourselves to do so, for your mind is not capable of forgiveness. It is the heart of the Goddess that forgives and She always stands ready to heal with her infinite love and compassion to open our hearts. Only then can humanity move forward in its sacred quest to reinitiate balance in our lives, individually and for the whole of the planet. With the approaching Equinox, the Solar King and the Moon Goddess are joining their energies in the sacred marriage of Hieros Gamos. In ancient times each kingdom was ruled by this sacred marriage for the good of the people. The king was the leader and protector of the people, and the queen the goddess in alliance with the earth who ensured the fertility and abundance of the land and the people. Since then, the quest for power has usurped the balance of earth. We no longer have a king as the protector of the people and a queen who honors the fertility of the earth. We have turned our backs upon the blessings of earth, driven to survive through personal toil and suffering. With this Equinox the God and Goddess are stepping into new roles, offering us the opportunity to initiate balance and sovereignty once again. 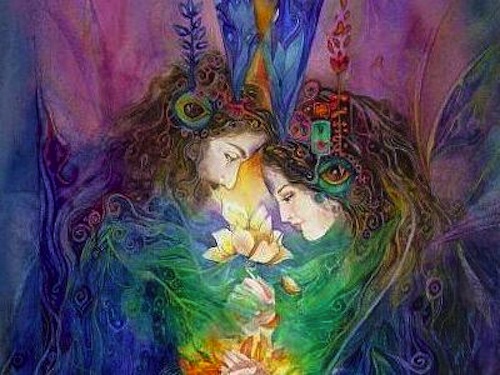 We are being called to honor the Sacred masculine and Sacred Feminine within each of us, and with each other. We are being called to honor our Mother Earth in a renewed relationship with all the Elementals in sisterhood and brotherhood with all sentient beings, thus opening the infinite flow of abundance without the need to gain power over one another to survive. With the second eclipse, the earth is being embraced as the Holy Child between the the Sun God in Libra holding the balance and the Moon Goddess in Aries, giving birth to a new race of enlightened beings equal in stature to one another. In addition, our solar system has entered a stream of gamma rays flooding us with the benevolence of the Universe. We are being bathed by an abundance of crystalline light from the cosmos as Blessings of Grace for all sentient beings. It is through this Christed Light that Divine Love is being restored within the hearts of each of us. These gamma rays are increasing the vibration of the planet to activate our dormant DNA, expand our consciousness, and awaken us to All-That-Is. Alas!! As children of the New Earth, new playgrounds await. Our passions abound and our joyous manifestations are imbued with divine wisdom. ‘Tis a majestic earth that gives so selflessly. It is with love and gratitude that I honor her. And I bow to the royal God and Goddess within each of us for stepping into our new roles in unity with Source. These messages are intended to be shared. You are welcome to share and distribute with others as you feel guided. Please maintain the integrity by including the author and source website link. What has happened to the American dream? Was it just a dream, as humanity continued to sleep walk? Or is the current unrest a clear sign that the masses are finally awakening? Or, are we creating a new dream worthy of a New Era for all of humanity? In a world of duality, we’ve carved a huge divide between those who “have” vs. those who “have not”. Poverty runs rampant while waste dwindles away unused. Children are starving while royalty feasts. The homeless are freezing on the streets while executives entertain in their lavish mansions. I could go on with the accusations, but there is no need because we all get the picture loud and clear. It’s particularly present in our own lives when we worry about how to make ends meet, when it stops us from doing what our hearts call us to do, when we shrink our lives smaller rather than expanding into our true essence. But, throwing barbs at those who “have” only expands the divide. It doesn’t do a damn thing to enhance our lives. In fact, it only escalates judgment, anger and hatred, which shrinks our already encroaching jail, pushing against our hearts like a vice. Victimhood only breeds more viscious victims resulting in violence and death. If it’s freedom and power that we want, we’ve got realize that it comes with responsibility, a responsibility to ourselves and humanity as a whole. And that, my BeLoveds, requires more than bitching about the situation. It requires a personal change in attitude and action. So the essence of affluence is “flow”, the flow of our energetic birthright from Souce, which has no limits, no destination, no agenda. There are no limits!!! WE are the ones who limit our affluence by our antiquated beliefs that there is only a limited amount therefore we need to “take” it from someone else, from a higher class of people than ourselves. What if we realized that there is more than enough for everyone? What if everyone has the potential to be affluent, to live in the constant flow of Source in whatever means we need in any given moment? What if you are ALREADY affluent and you’ve turned your back on it because you’re judging those who “have”, leaving you in lack as one of the “have nots”? Can it be that simple? By dropping our antiquated beliefs and judgments about money that we can be flowing with affluence… that there IS Affluence for everyone. Think how marketing would change? Politics? War? Healthcare? The list of potential change is endless and we’re the ones who can change it by aligning with affluence in ourselves and humanity. Our alignment with the simple Universal Law of Flow has the abilty to bridge the gap between the “haves” and “have nots” to lift all of humanity beyond duality, into a New Era where Affluence is for Everyone. I’m choosing to flow in the Universal River of Affluence, how about you? Bless you for sharing. . .